Based in High Wycombe, Buckinghamshire we specialise in the domestic market. 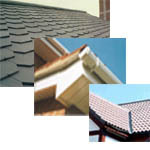 Whilst we specialise in flat felt roofing we offer a vast range of services which include roof tiling and slating, lead work, chimney renovations and uPVC Fascia, soffits and gutters. For more information please use the links to the left to explore our full range of services as well as contact information.